When you write a blog like mine you get a lot of fan mail. "I want to have your babies." "Please take these frilly knickers as a token of my affection." "My wife thinx your hot so I'm coming after your nadjers with a pair of rusty sissors, pal." Stuff like that. Now and again a letter lands on the doormat that stimulates my thinking. This morning I got one addressed to "Mr F. Encounters, c/o Postman Jim, Devil's Gate". (I think the Post Office is wonderful, by the way.) Here is what it said. "Dear Mr Encounters, My wife says there's no use asking you, because you're a bigger moron than me. But I figure someone who's been in serious scrapes all his life but isn't dead yet must have good problem-solving skills, as they say down the jobcentre. I got a fridge-freezer that is iced up so bad we can't get into our kitchen any more, and I'm worried about the polar bears. What should I do? Yours sincerely Nik Moss." Dear Nik, You have certainly come to the right place son, as I have had this problem several times myself. Other people will tell you to unplug the freezer and wait for the ice to melt. But these are sensible guys who defrost regularly. They are not you or I. It took the last Ice Age 5000 years to defrost. Nobody can wait that long for a cold beer. Basically you got two choices, pal - a claw hammer or a blowtorch. Both are risky. Use too much force with the hammer and you start an avalanche and have to be rescued from the snow by sniffer dogs. Turn the blowtorch around to see if the flame is lit and you set your head on fire every time. Trust me on this. Once deep into the ice, with torch or hammer, you will start finding objects that scare you. Most are sausages. The yeti or abominable snowman is a terrifying beast. But it lives in the Himalayas and is mythical, so you won't see any. Polar bears are dangerous but they rarely come to Scotland, as they don't like the rain. Who does? That just leaves the woolly mammoth. If you dig too deep you are certain to find one. 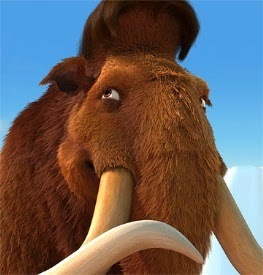 A thawed mammoth is a huge problem. There is no way you can get planning permission for tethering it to the side of your house. So it will have to live round the back. Mammoths fart much more than you want them to, like all vegetarians. This is both socially unacceptable and a major source of methane, a powerful greenhouse gas. That means your freezer has to work harder and will ice up even faster. This is what scientists call a vicious cycle. Then there's trampolines. I don't know about your street but down ours every back garden has one. A mammoth's great strength means as soon as it hears your neighbours' kids playing, it will barge the fence down and start bouncing like crazy, five hundred feet in the air. Mammoths on trampolines are a major cause of small aircraft accidents in several mid-western states, where the laws on keeping pets are very lax. Well that is about all I have to tell you Nik, and I'm sure you'll agree that defrosting a freezer is not as daunting as it sounds. Just take it steady and don't go as deep as the pleistocene. Good luck, keep in touch and please tell your wife to stop sending me frilly underwear. I got more than I can ever wear already.